1. 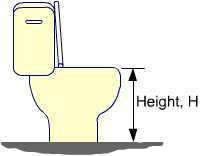 Those with a height (H) of up to 39.0 cm (measured from floor to the top of the toilet bowl with the seat lifted up). 2. Those with a height of above 39.0 cm. 1. Standard production model for sitting toilets up to 39.0 cm in height. 2. Customised sets for sitting toilets above 39.0 cm in height. As customized sets would require some tooling changes, additional time and effort, their price is US$20 more than the price of standard production models. The width of standard sitting toilets ranges from 36 cm to 42 cm. With the Sandun-Evaco toilet converter, toilet width is not a concern. It can be used with sitting toilets of different widths.